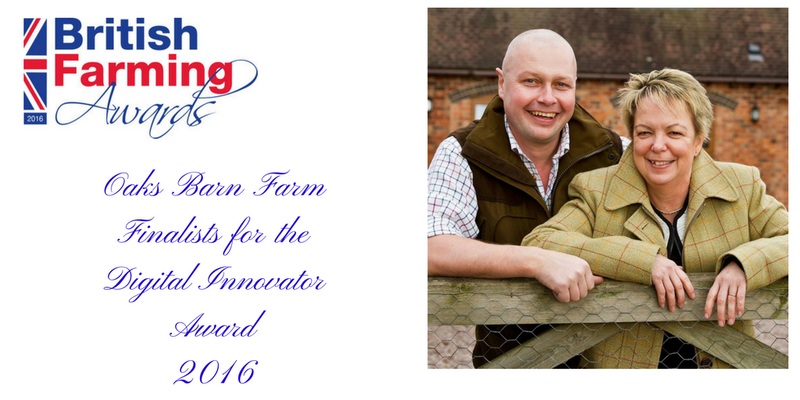 Worcestershire Based Oaks Barn Farm, are delighted with being shortlisted for the category of Digital Innovator, for the British Farming Awards to be held on the 20th October 2016 with Guest speaker Sally Gunnell OBE. Working hard to build up our luxury farm stay business over the last 10 years, Oaks Barn Farm has built up a social media presence promoting the Importance of backing British Farming and supporting local businesses. We are well aware of the spending power that our guests have in supporting the local economy and the impact this has to our region as a whole. Being a small independent, we have steadily built a social media platform for our Farm Stay Business and generates meat sales for our Lamb and Pork products. This news comes at a great time following Wayne having recently undergone surgery for bowel cancer and having been given the all clear, meaning he does not have to undergo chemotherapy, enabling him to return to the job he loves on the farm. Being shortlisted for this award is all down to our guest experiences which are reflected in our Trip Advisor Reviews, and our friends and followers on Twitter, Facebook, WordPress and Pinterest sites to name just a few. Thank you for your ongoing support and the difference you have made to us locally in Keeping Britain Farming.